After a lot of trawling around the internet I found a wrecked 1980 Yamaha IT175G that needed bringing back from the brink, 9 months later I have a bike I am very proud of, it's not perfect but I am happy with it. The IT175G was Yamaha's mid range entry into the enduro motorcycle market, based almost entirely on the highly successful YZ range and aimed directly at competition from the Honda XR range and Suzuki's PE or Pure Enduro offerings and later the KDX from Kawasaki. 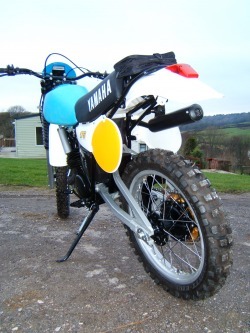 IT stands for International Trial and the bikes were built to compete in the ISDT and worldwide Enduro events which would cover all terrain types and proved very popular with clubman riders in the UK. The machines featured quick release wheels and were much lighter than road going trailbikes of the time. The IT range had a plastic fuel tank which was not road legal in the UK at the time and alloy tanks were made to overcome this. IT anoraks will notice a few non standard parts such as the YZ125 side panels, IT175H carb and the $1 toolbag from Target groceries in America, I have also collected as many IT related photos and articles as possible and hope that they might help you with your future rebuild or current machine.